Z, Costa-Gavras’ Academy Award-winning political thriller, this year celebrating its 40th anniversary, will be shown in a new 35mm print at New York’s leading art house theater, the Film Forum, prior to a national tour. Although it starred such iconic French actors as Yves Montand and Jean-Louis Trintingnant, the film was a politically sensitive hot potato for its French producers. Greek expatriate Costa-Gavras’ adaptation of Vassili Vassilikos’s novel of the real-life Lambrakos case of a military coup d’etat in Greece was skillfully filmed on a shoestring in Algeria (doubling for Greece), utilizing a pulsating score pieced together from earlier works by famed composer Mikos Theodorakis (who was under house arrest in Greece at the time of the filming). The film, which was an international sensation in its day and which was one of the first non-English language films to be nominated for a Best Picture Oscar, was shot by New Wave camera legend Raoul Coutard, whose raw faux-documentary style gave the film its breakneck pace and visual style. 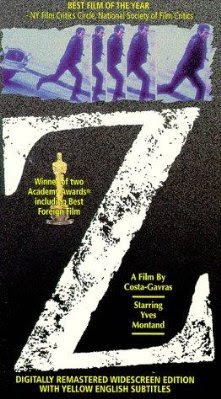 The film won the Cannes Film Festival Jury Prize and the Best Foreign Language Oscar, along with a record 50 other international awards in 1969.
conplimenti al regista ,costa gravas, per la sua lunga carriera, che dal 1968, sta girando film, con il sostegno della intramontabile arte cinematografica francese.